Our Bounty Hunter Time Ranger Metal Detector review takes you through the features of this VLF metal detector with waterproof search coil and large LCD screen. 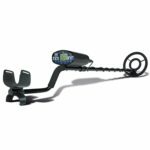 The Bounty Hunter Time Ranger Metal Detector features a fully submersible, interchangeable, 8-inch Bounty D-Tech search coil features an interchangeable coil with Ground Trac, a technology that automatically ground balances the machine to the soil conditions. This detector was launched about 10 years ago when its features were quite advanced for that time – so the price today is not a reflection of a cheaply made detector – it’s actually a quality detector with solid technology – it’s just a little old, but for the price, I think it’s a really good and viable option. We love the large, multi-function LCD screen with touchpad controls. It’s a little overwhelming at first, but once you get used it, it’s easy to use, even for older kids. It was certainly ahead of its time when released 10 years ago. 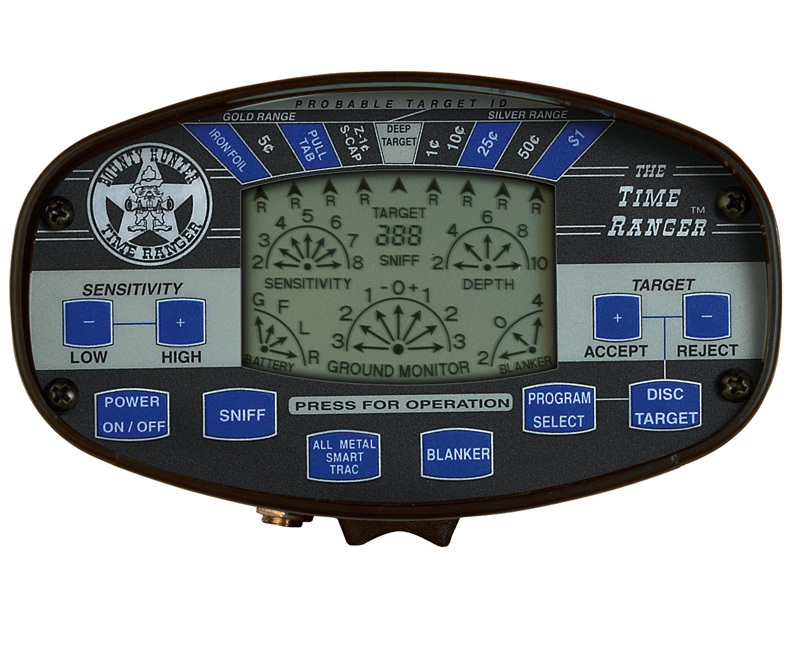 Unlike other units under $200, the TimeRanger metal detector has three-tone audio discrimination, making it easier to discriminate between targets. It also features four-level iron discrimination, as well as ‘Sniff’ mode, which is a specialized mode that can quickly adjust your detector to eliminate or accept one item on the target ID scale. Sniff mode is great when you find one type of trash item like a soda can pull rings repeatedly in an area – you can reject the pull rings while still detecting all other metals. It comes with an interchangeable 4″ gold detecting search coil, a great bonus! 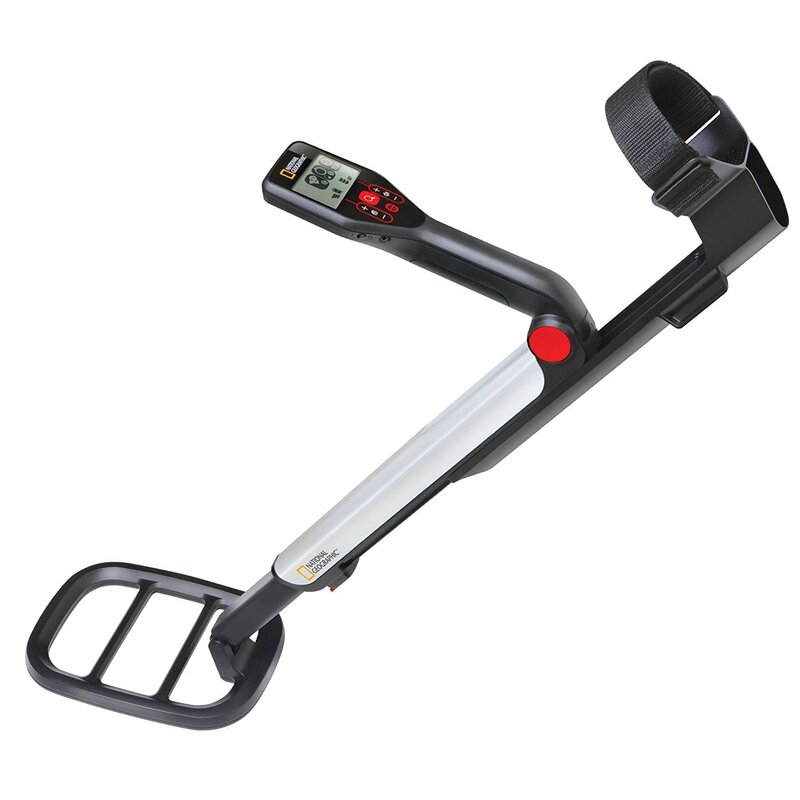 For its price and with its five-year warranty, we think this US designed and manufactured Time Ranger metal detector is well worth considering if you’re looking for a quality all-round device. It doesn’t have a specific salt water mode, but its excellent ground balancing function will zero’s out mineral content in the salt water. All reports say it works well in salt water. But remember, only the search coil is waterproof. The control is not, so do not submerge it in water. Adjustable length Yes, the length is adjustable. It collapses to 28 inches. 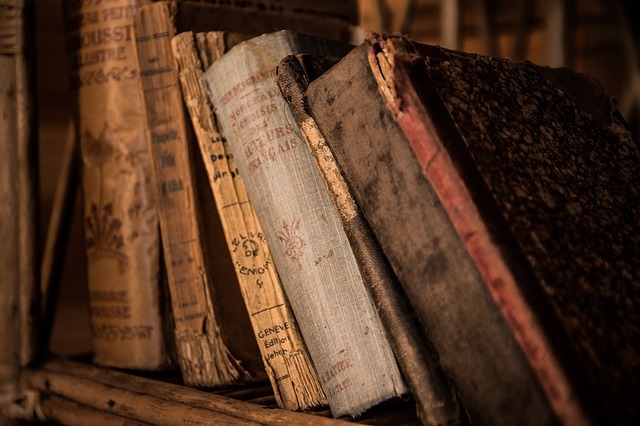 We think this model will suit beginners to those with some treasure hunting experience. For kids, we think from ages 12 and up it should be fine. The shaft is adjustable and with some instruction, they can quickly learn how to use the detector. 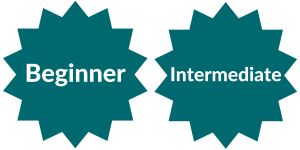 Download a copy of the Bounty Hunter Time Ranger Manual. You can find another Bounty Hunter Time Ranger tutorial on YouTube. There are plenty of reviews and demos to see. Bounty Hunter Time Ranger Metal Detector is protected by a 5-year warranty. Even though this model is discontinued, it is still protected under the five-year warranty when purchased new.